Exploding Collage is a series of three exhibitions inspired by Kurt Schwitters' Merzbarn*. Three contemporary artists are currently exploring the twentieth-century avant-garde response to the collage art form. Today's musical happenings in the Hatton Gallery were, supposedly, an attempt to create an immersive, improvised response to the gallery's artworks. Let's forget the premise and get to the jazz. 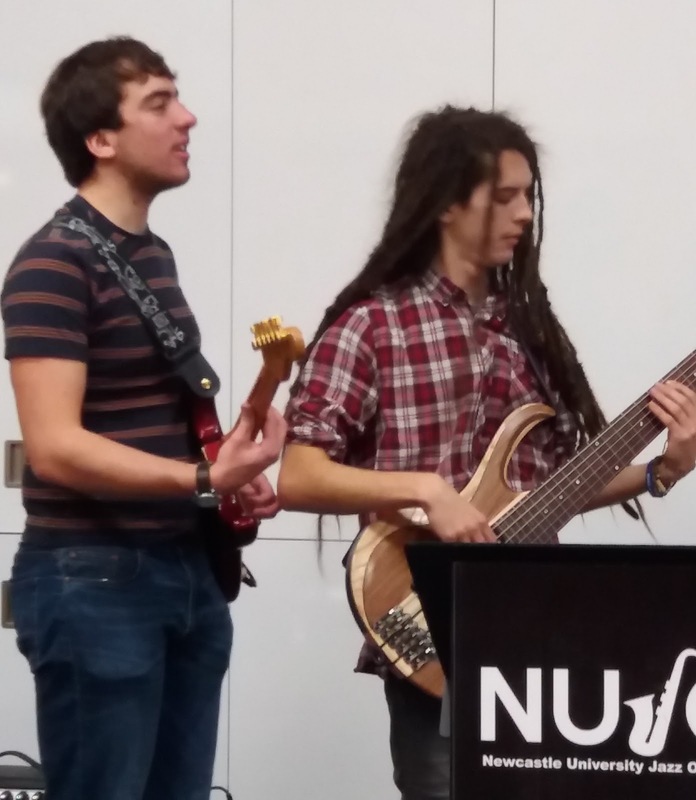 The lunchtime concert began a little late...they are students, you know! 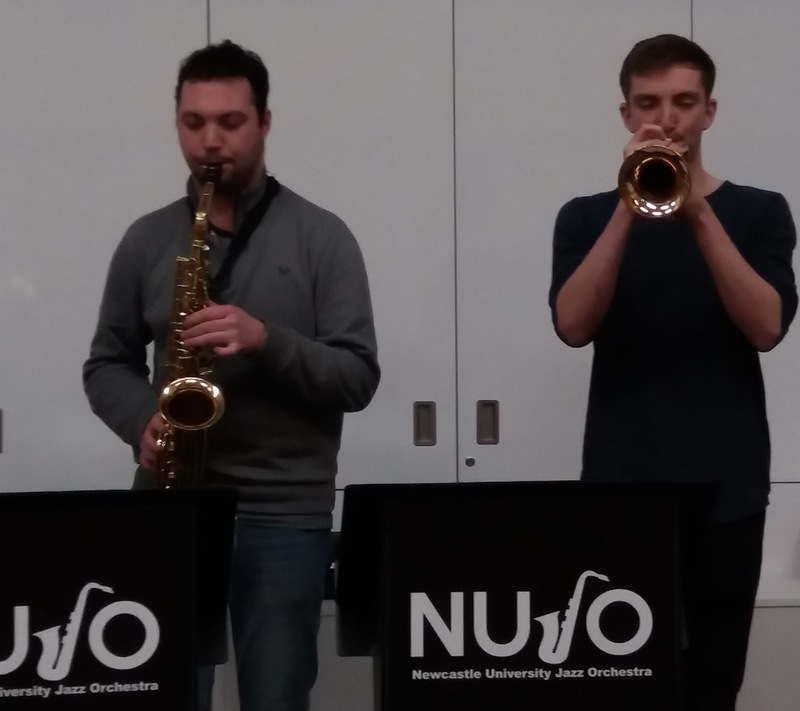 The six-piece combo, drawn from the ranks of Newcastle University Jazz Orchestra, was about to get things underway when its MD, guitarist James Cuxson, went in search of an amp. The ready-to-go quintet decided to play Autumn Leaves. Blue Bossa, Nica's Dream, Rodgers and Hart's Isn't it Romantic? and Watermelon Man - varied fayre, if nothing else. But wait, this was good stuff! Solid ensemble work - MD Cuxson quickly rejoined his bandmates making it a sextet - and a student backpack-full of fine solos. 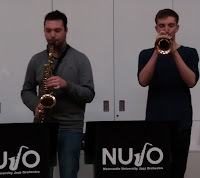 The horns - Matt Green, Tom Alcorn and Tom McDonald - have been heard mixing it at recent jam sessions and this afternoon's gig found them shooting from the lip. Trumpeter Alcorn impressed with his never less than assured, bold approach, similarly Green on alto and former Durham County Youth Big Band 'bone man McDonald. Drummer Archie Williamson's recent flurry of appearances at jam sessions has marked him down as one to watch and he did all that was required on this session as did six-string bassist Jack Deere-Jones, reading the dots alongside MD Cuxson. Green and Alcorn negotiated Misty as if they'd been playing it for decades and to close the concert on a dank day in town, McDonald thought it a good idea to send us on our way with The Girl from Ipanema. * Kurt Schwitters' WWII creation is a permanent installation in the Hatton Gallery.